Don't take my posting this as approval, however. While I appreciate the well-timed usage of the word "bebeh", reading entire sentences of this "language" gives me an almighty headache. So, if any of you DARE post some Lolspeak nonsense in MY comment section, there will be heck to pay! (Mostly in the form of me mocking you.) I mean it now - don't say I didn't warn you! For those of you who think spelling friends "fwends" is cute, though, go here. Get it all out of your system, and then you can come back. Hey Tanya, there's a gerbil on that cake!! Huh. I just noticed. Please tell me that's not a real gerbil. Please?? so... is that the birthday gerbil? You can tell a lot about a family from the type of animals they have on their cakes. For example, you know they're gonna re-use that 1 for her 10th birthday. Wait... are ALL Gerbils a year old? Just this one? Is its name "Gerbils?" Iz so cornfused! I didn't think gerbils usually celebrated birthdays. With cake. And life-sized "them" on there. But you know what? I kind of love it. Is that a real gerbil? At least this time they can confirm where they hair they find in the cake came from. I actually posted this to my Facebook during my daily (ok, hourly) visit to ICHC earlier. LOL @ Lisa, I think I scared the children laughing at that one. You have no idea how close I came to emailing this to you, but then I thought "oh I am sure that she'll get this emailed to her 1000 times!" "Mostly in the form of me mocking you." TEH INTARNETS IZ SRS BIZNS. lol @ lisa. thanks for totally blowing my cover. now people know i wasn't working since numbers aren't nearly as much fun. I despise treating pets like people. A gerbil doesn't know what a birthday is! It doesn't want cake! It only sort of knows you're there! It may be mean to get a gerbil's paws all froting-coated. And lastly, I DESPISE this stupid text speak. Its not cute, its not smart and its not even efficient! Ewe. Is the gerbil part of the cake? Is he stuffed with sugar and mounted and coveted like the frosting rose in the corner? I don't know why my brain went there. I almost sent this to you, glad I checked in first! The point of netspeak in these is to actually make fun of the people who use it. The people who make these don't usually approve of netspeak. I don't want sprinkles, please. Lemme Guess...Blue sprinkles, right? Pink? Oh, sure, it's kee-yoot (the rodent)...but that little ****er wouldn't get anywhere NEAR 1-year-old if it were scampering and *sprinkling* all over MY food. This cake gives me hope. if a creature with a short life span can get a cake...my cats obviously deserve one! That cake would also work for a pet snake's birthday! Thank you so much for the prohibition. One of my New Year's resolutions was not to try to read the comments on ICHC or YouTube. I'd hate to have them come here to me. I too considered sending you the cake, but then thought, "It's not a bad cake, per se, and if you're going to get a birthday cake for your gerbils, then they probably should be allowed to run around on it." gerbils live longer than a year? srsly? Somewhere, in an alternate universe is an alternate cake wrecks with a cake image posted on it, which says ("I want gerbil poo"). So I'm totally confused now. Not by the cake, which was disturbing, but by that other link. Perhaps I'm a little slo? Ok, you can kill me now.. I looked at that website for 3 seconds and felt as if my head were going to explode. That is my worst nightmare. Has this Gerbil no pravizi while making sprinkles? i didn't think that gerbils lived to one year, so congrats! and enjoy your newly diseased cake! What are they going to do after the gerbil's photo op? Will they eat the cake after the gerbil walks on it? Will they feed the cake to the gerbil? I love LOLCats, but I absolutely cannot take the comment section on that site. It hurts my head trying to read those comments. Ew. Gerbil on a cake? Srsly? Alas, even gerbils don't get to have sprinkles on their cake. A part of you has died today. Congratulations. 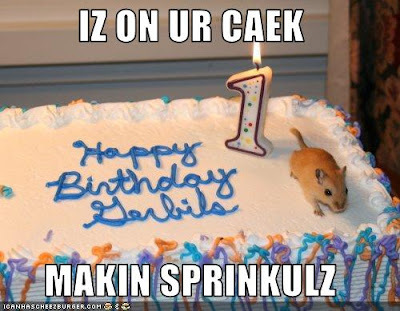 Now datz a caek a LOLcat can enjoy. In this economic downturn, what we need to be spending our money on, clearly, is cakes for animals who will die if they eat them. Isn't frosting on a cake like gerbil quicksand? Would you find a gerbil stuck in the middle of the cake, it's little paws covered in frosting? I am now disturbed by this cake and may possibly have nightmares about gerbils in frosting quicksand and it is all my own fault. I used to hate LOLspeak altogether but have gotten used to it in cheezburger's pictures and actually find it amusing there. It's kind of appropriate if it's supposed to be the animals talking. But if I'm trying to find out info on a picture and check in the comments, it just pisses me off to have to decipher through all the crap to find the answer. I don't usually bother with the comments. Yeah- Don't eat the sprinkles... but you should also watch out for the yellow frosting, it's not airbrushed!!! And come on - the silly string on the sides?? It would be a wreak without the gerbil *or* the textspeak. And now I kinda want a t-shirt that says "I want sprinkulz"
So, is this cake for a litter of classroom gerbils that miraculously survived to age 1? And is that their litter-mate that didn't make it as an ornament? I think we (us?) Grammar Nazis have come to a decision that lolcats are okay because it is intentionally poor grammar, and usually quite funny. I am Grammar Nazi, and I approve this cake wreck. Ok I subscribe to Cake Wrecks and ICHC in my RSS and I thought I had read every post there ever was on both, so I was surprised this morning to see the source for the Gerbil cake listed as Cake Wrecks, since I hadn't seen the gerbil cake before. So was it ever on Cake Wrecks before today? Iz gerbil taxidermist. U ned 1 fr speshel cak? Cal me. I hate lolcats and lolspeak and all of that crap. I would be shocked to learn that this ISN"T a cake my dearest troll-making friend got for her gerbils. Emma, I love you, but if this isn't already your cake then PLEASE don't use it as inspiration! The birth of the LOLcake? THANK GOD I'm not the only one who hates LOLspeak - it's so horrible and all I can think is that the person flunked 1st grade!! Word verification: colump, as in whoever eats some of that cake is going to eat columps of gerbil hairz. I am a die hard Grammar Nazi. In some cases, the errors made are amusing. Especially when post-secondary educated TEACHERS make more spelling and punctuation errors than my 6 year old. However, the lolspeak baloney gives me a splitting headache, blurry vision and extreme irritability. Not a good thing! Worse part is it is harder to read than misspelled english. the gerbil is extremely disconcerting. wow! I just got so confused, I was looking at my lolcats RSS feeds, finished looking at all the recent ones, and the last one was this Gerbil Cake (mmm Gerbil Cake). 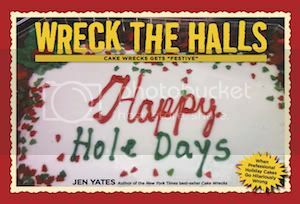 Then I click on Cake Wrecks - definitely my new favourite funnies, you are AWESOME! - and turn away from the comp for a sec only to find the same pick. Guh? I am owned by 17 cats, and I can assure you, not a one of them speaks in that alien LOL language. They may garble their syntax at time, but they know basic grammar rules. And they know how to use SpellCheck, too. I have a feeling, though, that my cats would appreciate that gerbil cake for all the wrong reasons. Word verification: coninuff. I've seen coninuff of netspeak, chatspeak and LOL speak, thank you! Iz thawts uv u wen I saw tis pic. (Both Cake wrecks and lol cats are in my reader, and look forward to both posts). So who thought we would see a lol cat on here? after i deciphered it, i will admit i laughed. gerbils have sprinkle turds. heh heh heh. I'll admit it: I love lolcats. But I HATE what lol-speak has become. It sickens me. Sure, say "teh" or "kitteh" once in a great while, but seriously? Every word? Every word has to be so incredibly wrong? Gimme a break. I also hate when people can't take the extra second and a half to type "your," but instead resort to "ur." I have to say it all stunted and stupidly in my head, which translates to whoever sent it to me in the first place slowly but surely transforming into an idiot in my head. But I digress. That has nothing to do with cake, which I love. Hee hee! It's so cute and disturbing! I was hoping this would be here! I think Lisa win the prize for that one. I love (luv) LOLcats and was wondering if this one would show up here. And that gerbil totally gets to eat the whole cake, because I won't be in line for a slice. While I agree that LolSpeak can be a bit of a strain for the uninitiated, I have to say I've LMAO (is that allowed?) more over icanhascheezburger than ANY other website. Learn to overlook the grammar and enjoy the humour people! ok - the total weirdness of buying or making a cake for a bunch of gerbils aside, along with the grossness of a gerbil sprinkle-making factory... i actually got a chuckle out of the link. especially the picture of the cat hiding in the corn pops cereal box. i liked the alternative quote though "sometimes you get the toy, sometimes the toy gets you." It'd also be the perfect quote for a clip I saw on TV where a catapault-like device flings cake at the birthday boy when he tries to blow out the candles. I'm gonna figure out how to do that one, and the caption will read "Sometimes you get cake, sometimes cake gets you"
Ez a gerbel on zee cakes, ya? I will point out, pedantic as I am, that LOLspeak in its purest form does not destroy every single word as is demonstrated in this image. It's supposed to imply that the critter (supposedly the "speaker") has limited knowledge of English and phonetically substitutes where spelling is unknown, as in "I Can Has Cheezburger?" Misspelling every single word (or substituting with a homonym) kind of wrecks the point of LOLspeak and makes it nearly impossible to understand. It has forced me to abandon any attempt at reading comments on ICHC because I have to stop and figure out what the idiots therein actually want to say. Subtlety is key. Rather, it should be. Agreed about the headaches with that LOLspeak. I unfriend people who use it on Facebook.... my own mother will be next. Okay so....normally someone is "can I have a piece with a rose on it?" Now they are, "Can I have a piece without a GERBIL on it?" I hopez you noes we luvs caykwrex a hole lotz! Of course the cake isn't for the gerbils... it's sort of like those parents who take their 3-month-olds to Disney World. Either way, the grown-ups think they're in for some fun, but they probably will spend more time cleaning up 'sprinkles' than enjoying themselves eating cake or spinning in a teacup. I love the pictures on the lol sites, but I hate the way they're captioned. They're impossible to read and usually it takes away from the cuteness of the picture. Ummm...so is the gerbil part of the edible decorations? Did it get there by mistake? Y'know, the only real complaint I have about CuteOverload is that Meg uses "eh" instead of "y" way too often. Does there really need to be a "kitteh" or "birdeh" ten times every post. nawww. so cute. I miss my gerbils, and so totally should have bought them a birthday cake, if I had known their birthday. They also probably wouldn't have really liked the cake. They were much more fond of healthy things like grapes, peas and sunflower seeds. OH NOES, SOMEBODY PUT LOLSPEAK ON A PICTURE AND SENT IT TO ME! IT'S THE END OF THE WORLD! Seriously, it's cute and it follows LOLspeak grammar. Calm down. LMFAO!!! i just saw the gerbil when I read your post!!!!! OMG, i iz givin hedake? cieling cat tellz me to! Gerbils can live to be up to three years old. However, if you feed them sugar they will probably not live as long. To Jenn -- for a self-proclaimed "grammar nazi", it is quite shameful that you don't know to start a sentence with "we", not "us"... you said, "We (us?) grammar nazis..." You had the right idea, but adding that parenthetical "us" belied a little uncertainty. "Us" can NEVER be used a the subject for a sentence. Sound it out: "Us grammar nazis love grammar." Nope. Next time you get all grammar nazi on someone, make sure you have it right first! On the same topic, "PerpetualMommyExhaustion" wrote: "And lastly, I DESPISE this stupid text speak. Its not cute, its not smart and its not even efficient!" That should be IT'S.. "It's not cute, it's not smart and it's not even efficient." You are using a contraction of "it" and "is", not a possessive its, hence the apostrophe. Next time you go around insulting LOLspeak because it's not "smart", uh, make sure you have your its and it's straight. Thank you. I iz on yer blog, specking in lolspeck! Satirical lolspeak (which is the point of ICHC/lolcats, by the way. WOOOOSH.) is perfectly fine.